The final movie to receive the mini movie review treatment tonight will be my favourite from the three: Harry Potter and the Deathly Hallows Part Two! The Premise: The final film in the intense and gripping saga reaches its climax at the battle at Hogwarts. Harry (Daniel Radcliffe), Ron (Rupert Grint) and Hermoine (Emma Watson) are still on their journey to find and destroy the remaining horcruxes to kill Voldemort once and for all but problems seem to always suffice with the deatheaters always on their trail. Their adventures take them to the depths of Gringotts, flying high in the sky with a dragon and returning back to their beloved school, Hogwarts. 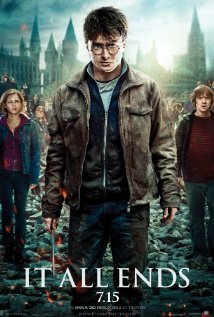 The return of Harry triggers an all out battle between good and evil when the students, faculty and aurors come to defend the school against Voldemort and his deatheaters. Who will win the fight that has culminating over seven books and eight movies: Harry Potter or Voldemort? This is the highest score I’ve ever given a film review and some may pertain this as bias since I am a Harry Potter fan. However, I felt that this half-film was executed quite well since when you do read the book, most of the drama and emotional moments occur during the latter portion of the novel which this movie is based from. It’s the highest score because every film and every scene that was created throughout the series has led to this one moment and one final battle and everyone who followed the series was eager to watch the final events; no one was left disappointed or distraught how the film turned out. Definitely a film that you should watch in theatres and purchase since this is the last film and there were memorable moments to watch.